Following a beta last month, the finished version of Android Oreo has now landed on the Nokia 8, bringing with it a number of improvements and new features. The update, which we’ve had confirmation is live in the UK, will presumably be coming to the rest of the world soon if it hasn’t already, and highlights include a new picture-in-picture mode, which lets you watch a video while using another app. That’s a feature you’ll find on most handsets rocking Android Oreo, but there’s also some stuff exclusive to Nokia handsets, such as ‘Dual-Sight’, which uses the front and back cameras simultaneously when shooting video, so you can stream your reaction to events on social media. 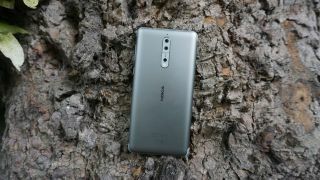 The Nokia 8 should also now power up faster and its battery might last longer, thanks to a feature that limits the background activity of the apps you use least. And speaking of apps, there’s no bloat here, with no unnecessary apps added as part of the Android Oreo update. But what you do get is over 60 new emoji, plus new designs for the existing ones. There’s also good news if you have a Nokia 6 or other Nokia handset, as you shouldn’t have to wait too much longer for Android Oreo, with HMD Global – the company behind recent Nokia phones – claiming that Oreo is coming to other Nokia handsets soon.